Pereira written off in just one season with the first team. How am I not surprised? This is Caf, get used to it. Young players needs time to adapt, he just got the first taste of the first team on not so consistent basis. He will improve once he is assured about his chances and future in this United team. To those people who has written him off, feck off. Even Dalot has been written off. We apparently need a world class right back that would consign him permanently to the bench and of course in no time feck him back to portugal. That coming from the same people that are jealous of Liverpool's fullbacks, complain about our spending and how we don't spend more on young players. He is not really young anymore and this isn’t his first season, you talk about him as if he had just break through and was a 17-18 year old player. He is 23 already, he should be showing real improvement by now. We are all about promoting the youth then lets give real youth chances, players like Gomes, Chong, Greenwood. 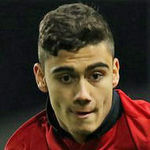 The sad reality is that not all the academy players have what is needed, in fact most youngsters are not and will never be United quality, with some luck we will find true geems but we cannot keep wasting time on players that have been around the first team for 3-4 years and still need time to prove they might eventually become good enough. 23 is not young anymore? I'm 28 means that I have to reserve a place at retirement home? He was a journeyman finding his feet. Just until this season he got the taste of proper fist team player. He needs time? give it to him to settle mentally and physically. Not every player is Ronaldo or Rooney who can peak at their early 20's. Nobody said it's easy even if you have the talent to succeed, it takes so much more than that. 23 is young for a footballer and it's first full season with us, same as it is with Dalot and Fred. Writing him off is daft because the PL has proven time and time again that the step up for some players takes longer than others, especially since he just came from La Liga which is a naturally less physically-demanding league. You're right, not all academy players have it, but Pereira has always been one of the more talented players in his age group since we signed him as a kid. He showed enough at Granada and Valencia to show what he's capable of, he showed plenty of improvement while on loan too, so much so that both clubs wanted to sign him. He's more than capable of being a squad player here, it'd cost more to replace him than keep him in the current market. As for the point I've highlighted in bold, what on earth are you on about? Again, this is Pereira's first full season with us. Age generally doesnt matter, what matters is game time. I'd say you know what a player is about after 100-150 appearances which is about 3 full seasons of football. I'd say Pereira has one more season in him before the youth excuse goes away. He's got the talent, but doesnt have a defined role. From what I understood he was decent but not outstanding on his loan periods. Writing him off is equally as daft as playing him at United for the sake of it. 23, at least for me, is young but not a youngster. You don’t look into other teams 23 year old players and consider them as youngsters, there are plenty 20 to 22 year old players that are already starting in the big leagues. We bought Pogba back from Juventus when he was 23. I don’t remember Valencia wanting him to stay, he started well there but then he faded away and ended up benched. It may be his first season with the team, but it’s not his first season around, before being sent on loan for the first time to granada he was already at the first team, not plenty of chances but he was around. Then 2 seasons spent on loans thats 3 seasons and now this one its 4 seasons where all we can really talk about him is preseason games and how good he was on lower levels, like I said he should had proved that he was good enough enough a long way back. Im not saying it’s impossible he will turn things around and become a star, but it’s highly improbable, I would ship him away. Well seen as Andreas himself confirmed they did then they obviously did. Unless Valencia are cool with their players giving interviews during the season making stuff up. And he started as their 12th man and ended their 12th man after getting injured. He was always the number one backup rotating with their own younger players so it was very unlikely he'd ever be permanently favoured to their own assets. And if you're counting his loans then you can't claim the only thing you can talk about his pre season performances. He was the best player on a bottom La Liga side and then a decent squad player for a top 4 side putting in great performances against some of the best teams in the world. Not bad for a 21-22 year old at the time. And la liga is in no way a lower level. I think he should be played on the wing. Got the skills to do it and with both Martial and Lingard sidelined, he would be a perfect replacement. I hope he replaces Lingard instead of Alexis. Who do we throw in then? Lukaku and Alexis have been worse. Don’t think it’s a bad idea trying to blood him into the tempo of the league in a less pressured position. Alexis has been rubbish most of the time but he has been injured on and off.That messes with consistency. He showed against Arsenal that he can deliver. Lukaku has been ok coming on and again was fine against Arsenal playing on the right. Come on, Sanchez has been here for a full year now and hasn’t impressed in a single game. He’s contributed in a few games as has Lukaku but neither of them have ever looked capable of being anything but a detriment to the evolution of our team.. Neither has Pereira yet but he’s barely had a fraction of the chances they’ve had, and the few chances he has had have always been in second string teams with dysfunctional set ups. People are coming around to his disposal just like they were with Shaw, Martial, Pogba and writing off Rashford while Mourinho was still here. In my opinion this thread is a prime example of the same narrow minded thinking that led people on here to believe Mourinho when he implied that Rashford and Martial weren’t even fit as back-up to Lukaku after the Brighton loss back in may. Ok, let’s hear your suggestion then. I think he would be a better Lingard replacement than Mata/Fred. I've watched enough of him over the last 5 years ago to know he isn't going to make it here. He's lightweight, mentally weak and in all honesty a pretty crap passer. Taking corners with both feet and the odd cruyff turn does not make you a United player. He's been our worst player this season when he's got his chances and he will leave the club this summer. As for playing on the wing I cant really see what he would offer. He's got a nice right foot but isn't any quicker than Sanchez or Mata. Lukaku is the choice. He did well against Arsenal on the right. The only other option is a system change, maybe adding Fred in. Other than that were stuck with more Sanchez and Mata because the only other player who could have done it is Greenwood and he's now injured as well. There's no way he's played enough football to be called worst of the season. Apart from the goal vs Wolves Fred has definitely been worse and Lukaku and Alexis has done nothing but enforce their inadequacy this season and one game vs a suicidal Arsenal side doesn't change that. Mata, Lukaku and Alexis have had plenty of chances and they're never going to be anything more than they are right now, Andreas still has a chance of developing into a useful player for us. I'd say he has very little chance. Wouldn't be surprised if he's played his last game for us. He's in the 20 man travelling squad for the FA Cup game. If he plays he should not be played in a DM role. He simply gets rolled over. We could use the diamond again. He could do a job at the tip of it? No. Sanchez has been our worst player, and it's not even remotely close. They've both been awful. Hows that? Pereira has been less bad though. Think he'll get a good few minutes tonight.For his sake I hope he shows something. Would rather give Fred a run now. Pereira's contract is up in Summer and I can't see a reason for renewing right now. I see no reason not to play the first choice trio tonight - the players have had six days since the last game, and will have six days till the next one, so rotating for the sake of freshness is unnecessary. Hypothetically when he does next play, I hope it’s as the left-of-centre midfielder with either Matic or Herrera holding, Pogba to the right and the first choice front three. Are you sure? He had first run at it but was so bad against Brighton that Jose didn't even consider him again. He did exactly nothing against championship strugglers Reading and basically gifted away two points against Burnley. Sanchez has been awful too but not awful enough to get dropped from the squad for the next game. Unlike Pereira who has been dropped from the next squad pretty much every time he's played. Sadly i think he will be sold in the summer. Will still carve out a career. Just not at a top club. He has had his chances. He looked nervous against Burnley i think it was. Looked like the pressure got to him. Good by Solskjaer to bring him on higher up the pitch today. Didn’t do anything but good to see him get another chance. Yep, this is what he needs for the remainder of the season - minutes in the position he naturally plays, not some cobbled together DM spot. Maybe I'm wrong or I'm having a confirmation bias. He didn't follow the tactical instructions when he came on, his job was to man-mark Jorginho and prevent Chelsea from starting attack (which Mata did very well),but he failed to do it several times, I saw Ole talking to him after that. Managers field player with abilities and or players who follow tactical instructions, he's doing neither of this. He may be gone come summer. He did ok, I guess ?